Is it An Emergency if No One Is Bleeding? Wondering if you can watch TV is not an emergency. Telling me that your stomach hurts everytime you get up and can you watch TV is not an emergency. And finally, wondering if Abel should be playing Nintendo as he isn’t supposed to and wondering if you can have some banana bread and since we’re talking anyway, would it be ok if you watched TV is really and truly not an emergency. Here is a story about Mauritania that was headlined on Yahoo. It concerns Mauritania's second biggest city, Nouadhibou. Until this last year, there was no road connecting the two cities. Now there is, and it goes right by my house. If you check out the story, you will see a picture of men wearing the long flowing white robes, called in Hassiniya Arabic dra'ahs, which are typical clothing here. Now, if you were going to put together a celebration of reading, what would you do? Me, I’d have games and bright balloons, free books, people dressed up like characters from them, people reading stories, puppets, etc. Not so the French! Instead, they tested on comprehension for all the books read throughout the year. What a great celebration! I managed to survive my 4 hours at the French school. Speaking to children in a foreign language is more difficult than speaking to adults, I’ve found, and in an informal survey taken of my friends, I think my experience is common. Kids speak more quickly, they use more slang, and they are less understanding of my mistakes and funny accent. It was fun staying for school with my 3. We walked in and they scattered to their classes while I stood under a tree with some other parents. Already at 8 a.m. it was starting to get hot. I was assigned a desk under an open tent, testing the K-Gr 2 on extracts taken from various books. I had to read them aloud! The kids were divided into teams of 3, one from each grade. As a team raced up to me and I began to read the instructions, I would see looks of stress and panic appear on their little faces! But once I read the extracts, which I did with lots of expressions even as I murdered the vowels, the panicked expression would be replaced with confidence. “Je sais! Je sais!” (I know! I know!) they’d shout, and hands would shoot up into the air. It was even kinda fun. At the recreation (recess), I went with the other mums into the teacher’s area, where I was given a tiny cup of extra-strong coffee. I chatted with 2 of my 3 kids’ teachers, where they revealed to me a human side that my kids don’t even suspect exists! Then it was back under the tent for a rather-difficult crossword puzzle with older kids. By noon, I was heat-fatigued. Although I’d been in the shade the whole time, it was 104 degrees outside and the water in my bottle was hotter than the coffee had been. Still, no one laughed at my accent, at least not to my face, and everything went fine—even according to Ilsa, who is often ashamed of my accent. Home for lunch, then up to the university to pick up an enormous stack of thesis papers. Juries start next week. In fact, I should be reading them right now! Last night we had our annual thank-you dinner for those who volunteer at Oasis Books. We include Midwesterners, Southerners, Canadians, and Donn and I, with our ideal West-Coast accents. (You must admit it’s easiest to understand and pleasantest on the ear… J ) We got into one of those you-pronouce-bag-HOW? conversations, and hit on words like aunt, crayon, garage. Towards the end, we noticed our two non-native speakers staring at us; a Dutch woman and a Brazillian man who learned English in Wales. “Do you ever have conversations like this?” we asked. They shook their heads. Guess they really don’t know how to have fun in Sao Paulo! My neighbours are putting a permanent tent on their roof. So far they’ve got the wood frame, covered in tightly-stretched material, and now they’re putting a sort of chicken wire round it, over which they’ll put mosquito netting. I’m sure it will come in handy as a sleeping area in the hot season, which we’re heading into. These permanent tents are a fixture in Nouakchott, no matter the socio-economic status of the family. We have one too—we call it the gazebo, and sometimes we drag out the matlas and cushions and sit there with friends, but everyone else refers to it as our khaima, our tent. This is a culture that until recently was nomadic, and that still celebrates the nomad. Every summer, as soon as school lets out, there is an exodus from the city—pick-up trucks or small sedans piled high with all the household furniture, crammed with entire families, heading east into the desert. Families return to tiny desert villages for months on end; some live in tents after the rains, and drink camel’s milk and eat dates. This is considered the height and depth of Mauritanian culture—the deepest and best experience that life has to offer. Poor families live in their tents, often pitched on a scrap of land between the beautiful villas of the rich. This sharp juxtaposition of two opposites is common here, in a culture that is changing so quickly you can get whiplash just watching it. Most Mauritanians, both men and women, still wear traditional garb, but it’s common to see a Moorish man, in a long flowing pale blue robe, driving a brand-new Mercedes while talking on a cell phone. Another man, in a suit coat and tie, sits in the passenger seat. On the major thoroughfare that runs from Morocco down through Senegal, connecting the entire West Coast of Africa, donkey carts slow traffic to a standstill. Sometimes when I pick up the kids from school in the heart of the city, I see cows standing mute in a bit of a shade. Herds of camels trot sedately down the street—in fact, at our old house, near to the French Embassy, our nearest neighbours were a herd of camels. 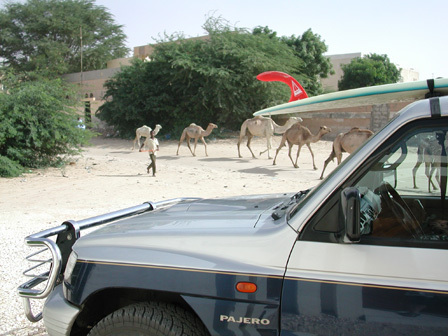 Here is a picture of our car, with Donn’s surfboard on top, and the camels passing by. A friend told us that their owner “loves those camels better than his own daughters,” and certainly the camels were well-tended. I have no idea about the daughters! The love affair of the nomad with the camel continues unabated, although nowadays camels are transported long distances in the back of pick-up trucks. It’s quite a sight, although it is difficult for Americans, raised on movies that say things like “no spider was harmed in the making of this film” at the end, to watch the process of the camel being loaded or unloaded. First the camel is forced to kneel, then ropes are tied around its knees (camels are double-jointed). Another rope in the mouth holds down the tongue, a sensitive part. Then, while men hang onto these ropes, a group of other men hoists the camel up, while it tries to whip its long neck round and bite them. Sometimes they drop it. The camel bellows. I’ll try to get a picture, although in our new house we don’t have camel neighbours—just goats, who try to get in and eat our garden, donkeys, and the wild dogs and cats—all these are common in all areas of the city. 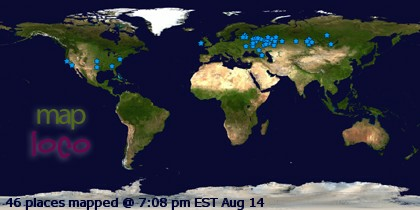 SIF: Click on the thumbnail picture to see it bigger. It took me 2 days to get this picture to upload! Today I am much better, just dizzy with tiredness. But now Donn is sick. It’s terrible being sick at the same time as your spouse. Who will bathe my fevered brow and fetch me cold drinks? Not to mention I’m not quite up to fetching him cold drinks and waiting on him hand and foot either. Worst of all, he doesn’t have the same thing I’ve got. Instead of aches and a lowgrade fever, he’s got a terrible cold/cough and um, tummy issues, she said delicately. Life overseas tends to include lots of those. But I don’t want to get his illnesses! Plague stalks our dwelling. Already my nose is starting to run. Before he was struck down, Donn made it to Mauritel this morning and guess what?! Our billing problem has been solved! Alhumdullilah, as they say in Arabic. I let Elliot talk me into doing a 4-hour stint at his school’s Lire en Fete (basically a Celebration of Reading) this Thursday. I just got a note from the director telling me I’m running a booth! AUGH! HELP! I can’t do this all in French. My French is so rusty, after a year of reading thesis papers and teaching ESL and having all my French friends sign up for English classes and practice English with me. I was envisioning something a bit more behind the scenes, or perhaps reading “The Cat in the Hat” in English or something. After all they are all learning English. I’m so stressed. The things we do for our kids. But he said, “Please Mom, you never help at my school.” What would you have done? Yesterday I was achy and I was up all night with a fever and chills. I woke up with a splitting headache. Headache, fever, chills? I sent the family off on their own and settled in to a quiet morning in bed. I made the mistake of getting out our copy of “Where There Is No Dr.” This handy book assumes that, while there is no doctor, there is a large, well-stocked pharmacy nearby. It also has lots of graphic drawings—helpful, no doubt, if you are wondering if that skin lesion is leprosy or merely part of a tubercular rash, but a bit disconcerting when combined with a splitting headache and a morbid imagination. I lingered a while in the fever section, wondering if I could possibly have malaria, dengue fever, or typhoid—my symptoms fit all of them. Except my fever wasn’t that high—yet. I wandered over to the “colds and coughs” section and decided I wasn’t going to die after all, especially as by this time the ibuprofen (sold locally as Brufen) was kicking in. If my fever continues to mount in the following days and I experience other symptoms, I’ll let you know, but I doubt it. I’m already much better. When Elliot was 5, I found him leafing through the section on childbirth. It has extremely graphic drawings—suitable for a book of this type, but for a 5 year-old boy, not so much. “I just want to be ready in case I need to know,” he told me. That made me relax, as you can imagine. So it’s not exactly a fun and meaningful Mother’s Day for me. That’s ok—we can always celebrate the French version, which is the one the kids make me cards in school for. Last night, in spite of the aches, I went to a birthday party for an Arab friend of mine; one of my students. She’s Palestinian, not Maure, and although she has lived in Mauritania for her entire life, she and her family are noticeably different. I suppose we don’t blend in that well either, come to think of it, but you can always tell a Middle-Eastern Arab or even a Moroccan from a Maure. It was a great party. Women only. Everyone arrived covered head-to-foot under colourful local veils, which were instantly removed to reveal skin-tight halter tops, tiny skirts, nose-bleed-inducing sparkly heels, and bare midriffs. Soon we were all sitting round clapping as the girls took turns belly-dancing to Arab pop music. It was great fun. Ilsa, who just turned 9, was persuaded to join in, and she had a blast. They invited me as well, but I didn’t see any of the other married women dancing, so I didn’t know if it was appropriate. Some of the girls concentrated deeply on their moves; other were laughing and singing along as they danced. It was strange to see movements that we in the West would view as sensual being done in front of an all-female audience. I also liked that none of these beautiful girls were what we’d call thin in the West—yet they obviously enjoyed themselves unselfconsciously. The room was solid people, and the door was closed so that no passing male could get a glimpse in, so it was stiflingly hot. Soon they brought round tiny glasses of bissop—made, I think, from hibiscus flowers, a really good local drink the color of cranberry juice. There was also lots of good food—tabouli salad, falafel, two kinds of cake. We gathered round the birthday girl and her one large candle in a cake she’d baked herself, and sang along to a taped rendition of “Happy Birthday”—first in French, then in English, then in Arabic, then disco-style in English again. A rumour that the girl’s father had returned caused a general panic, and the veils were whirled round them once more. False alarm; the girls relaxed once again. Later, the birthday girl opened her presents—that is, she and all her friends and sisters opened them. One friend tried on 3 different kinds of perfume, and her sister put on a new ring. I’m sure that at the end, she got all her presents, but I liked how casual she was with them initially. The point is, she was having a wonderful time with her family and friends.